TRANSPARENCY INTERNATIONAL ZIMBABWE (TIZ), a non-governmental organisation (NGO) publicly touted as a watchdog against corruption, is reportedly funding shadowy political groups pushing for regime change, a departure from its official mandate, it has emerged. Transparency International is funding Promise Mkwananzi’s #Tajamuka, Sten Zvorwadza’s National Vendors Union Zimbabwe (NAVUZ), Samuel Wadzai Mangoma’s Vendors Initiative for Social and Economic Transformation (VISET), Mfundo Mlilo’s Combined Harare Resident Association (CHRA) and Chitungwiza Residents Trust, among many more others. This comes against the background of the European Union’s mobilisation of US$5 million to fund anti-Government activities in the country ahead of the 2018 harmonised elections. Over the last decade, the EU has supported active ‘development’ and ‘progressive’ social change agents in more than 1 000 ‘creative’ projects. The Patriot is reliably informed that funds from TIZ were used to oil the #Tajamuka demonstrations that led to the destruction of property in 2016. TIZ financed several advertorials by Promise Mkwananzi’s #Tajamuka/Sesijikile in the private media, Daily News, where the group was attacking Government and mobilising people to support stage-managed demonstrations against Bond notes. Mkwananzi has led sporadic demonstrations in the country calling for youths to use violence and hate speech to effect regime change. Once a close ally of the late Morgan Tsvangirai, Mkwananzi split with Tsvangirai in 2014 and went with former Finance Minister Tendai Biti’s Renewal group. He also left Biti and joined Elton Mangoma to form the Renewal Democrats of Zimbabwe where he was briefly secretary-general. He again left Mangoma to join social movement #Tajamuka in 2016. Mkwananzi’s wife’s education at Argosy University in the US is also donor-funded. Stan Zvorwadza has been engaged in pushing for regime change by influencing vendors in the city to disregard by-laws that regulate their operations. Zvorwadza is on the forefront of calling for violation of the by-laws and encouraging vendors to riot on the streets. NAVUZ claims to ‘represent’ street vendors and finds the slightest excuse to spark disorder and chaos in city centres. Zvorwadza, who says he was mentored by the late MDC-T leader Tsvangirai, has urged his ‘members’ to cause mayhem for his personal monetary benefit. Zvorwadza has captured the attention of regime change architects as his organisation claims to have ‘six million’ members. Vendors, in the past, have been alleged to have brought into town stones that have been used to destroy property in the Central Business District (CBD) during illegal protests led by the likes of social movement #Tajamuka/Sesijikile. Zvorwadza has openly told vendors to disregard the authorities and continue operating in undesignated areas. And, to vent their ‘anger’, arising from refusal to operate in legally designated zones, vendors have been encouraged to literally fight the authorities who seek to remove them from these illegal points. In a bid to attract donor-attention, the NAVUZ leader has held unsanctioned one-man protests in the city. He has had connections to anti-Zimbabwe (an) organisations such as the Zim Vigil, a UK-based group that was formed in 2002 by the late former MDC treasurer-general Roy Bennett and Tony Reeler of the Amani Trust. The Zim Vigil founded the Zimbabwe Restoration of Human Rights (ZROHR) in 2007 as the local chapter of the London-based organisation and Zvorwadza was the vice-president of ZROHR and later became the chairman of NAVUZ. VISET director, Samuel Wadzayi Mangoma, is also being funded by Transparency International in efforts to effect regime change. Mangoma was coached for the task ahead of him in 2016 when he attended the Mandela Washington fellowship for Young African Leaders. Mandela Washington Fellowship for Young African Leaders, begun in 2014, is the flagship programme of the Young African Leaders Initiative (YALI). These young African ‘leaders’ are on the forefront of pushing for regime change in Africa, as they have been taught and brainwashed to despise their past and heritage. YALI was established when the US interests on the continent shifted from opposition political parties to the youths. The term, ‘generation democracy’ best describes the targeted group. Upon returning to their home countries, Fellows continue to build the ‘skills’ they have developed during their time in the US through support from US embassies, four regional leadership centres, the YALI Network and customised programming from USAID, the Department of State and affiliated partners. He is currently studying civic leadership at the University of California, Berkeley. Mangoma has also been encouraging vendors affiliated to his organisation not to comply with council by-laws. It is obvious his appetite for anarchy is no different from Zvorwadza’s. However he has shifted focus from urban to rural areas. Mangoma has been actively involved in rural areas through Vendors Action for Constitutional Reform (VACRE) project which he launched upon his return from the United States. In Jerera, Zaka, his organisation has trained more than 100 people on regime change. The trained villagers are expected to take their knowledge to their communities. The organisation mostly targets youths and women. The programme is done as a Trainer of Trainers (TOT) and focuses on ‘constitutional rights’, ‘transparency’, ‘accountability’ as well as ‘awareness and advocacy’. The villagers are trained to disregard the authorities and ‘trade freely’ wherever they want. VISET, under the guise of a ‘clean-up campaign’ in Waterfalls on July 11 2017, distributed political messages under the guise of educating the community on constitutional, socio-economic rights and empowering them with tools for social accountability and transparency. “The Socio-Economic Champions (SOCHAMPs) took advantage of the clean-up campaign to distribute IEC materials on constitutional economic rights,” according to a post on their Facebook page. Between June 29 and 30 2017, VISET also participated at the Crisis in Zimbabwe Coalition (CiZC)-organised Civil Society Policy Caucus at SAPES Trust. The caucus was held on the eve of the Zimbabwe in Transition Reform and Reconstruction International Conference hosted by CiZC and SAPES Trust in collaboration with National Endowment for Democracy (NED) and Chatham House. US’ NED and Britain’s Chatham House have been pushing the regime change agenda and were very actively involved in the ill-fated formation of the MDC in September 1999. Mfundo Mlilo, executive director of Combined Harare Residents Association (CHRA) is also sponsored by Transparency International. Mlilo is a prominent member of Crisis in Zimbabwe Coalition (CiZC) and a former ZINASU director. CHRA is an umbrella organisation covering areas that include Harare, Chitungwiza, Norton and Ruwa. The regime change proponents have resorted to using groupings that directly deal with communities. 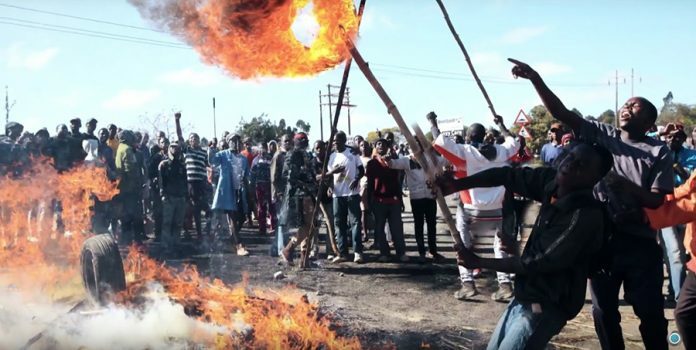 And the country’s residents associations, such as CHRA and Chitungwiza Residents Trust, among other groups, have been engaged to create chaos across the country. Mlilo is a beneficiary of the George Soros’ fund as an Africa University’s Institute of Peace, Leadership and Governance (IPLG) graduate. Soros is a well-known regime change financier. Combined Harare Residents Association has received funds from NED to mobilise the urban youths. In 2011, Mlilo received US$30 000 from NED to mobilise the Harare youths for regime change programmes. According to Mlilo, all that is required to overthrow the ZANU PF-led Government is a ‘burning’ Zimbabwe that will warrant Western interference. Mlilo is on record calling for illegal, unsanctioned and provocative protests by the likes of Patson Dzamara, who are in fact paid to get into the streets. “We need to shift the mindset of Zimbabweans,” said Mlilo. Commenting on street demonstrations initiated under the #Tajamuka/Sesijikile banner, Mlilo said: “I argue that this is a significant development, the likes of which has not been seen before in Zimbabwe. “Those who are doubting or questioning it are most probably informed by a fear of the unfamiliar and unconventional. “It is not the campaign they are used to or expect. Mlilo’s mantra takes its cue from his Western handlers who have deliberately downplayed the achievements of Government. Speaking to The Patriot, Transparency International programmes manager Frank Mpahlo confirmed working with and capacitating Mkwananzi, Zvorwadza and Mangoma under the Open Governance Progamme running 2017-2018. Mpahlo also confirmed they are also working with youths in voters electoral integrity programmes in Mutare, Nyanga, Mutasa, Chipinge, Hwange, Gwanda, Nkayi and Mbire-Guruve. “Transparency International Zimbabwe has engaged many youths in urban and rural areas to collect information in their respective communities,” said Mpahlo. He, however, refused to comment on the allegations of promoting the regime change agenda, arguing he was too junior for that and only the board chair, Richard Makoni, could respond. However, many local NGOs have been fingered in recruiting youths, especially in the Matabeleland provinces in a programme to collate ‘crucial’ information. Such organisations included Radio Dialogue, Bulawayo Agenda and other NGOs operating in Matabeleland North. Under the programme, which was dubbed ‘Citizen Journalism’, youths from rural and urban areas are to gather ‘grievances’ in their communities and channel them to different countries seeking to destabilise Zimbabwe. This has seen the introduction of social media in the rural areas. In rural areas such as Gokwe, Lupane, Dete, parts of Hwange and Binga, youths are being given and receiving training in the use of state-of-the-art cameras, laptops and smartphones to use in the dissemination of information. Radio receivers have also been given to selected individuals. This regime change project has also been highly visible in Matabeleland South. According to its 2012 Annual Report, Transparency International is funded by Western governments (with almost €5 million from the UK government) and several multi-national companies, including oil companies Exxon Mobil and Shell, hedge funds KKR and Wermuth Asset Management, Deloitte and Ernst & Young. In January 2015, it was reported that Transparency International (TI) accepted US$3 million from the German engineering multi-national Siemens, which in 2008 paid one of the largest corporate corruption fines in history, US$1,6 billion, for bribing government officials in numerous countries. Transparency International applied for and received the money from Siemens, even though TI’s due diligence procedures prohibit the organisation from accepting money from corporations that want to ‘greenwash’ their reputations by making donations to TI. “If any corporate donor is accused of having been involved in corruption, the donor can expect no protection from TI,” the procedures state. Transparency International received the money from the Siemens Integrity Initiative about a year after the Initiative hired former TI staffer Jana Mittermaier, raising questions of a ‘revolving door’ that has benefitted both the organisation and the company. It seems the NGO — from the mother organisation headquartered in Belgium to National Chapters — is shrouded in malpractices and scandals. Next articleHero or villain’s welcome?